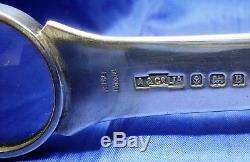 A RARE SOLID SILVER COMBINATION LETTER OPENER. 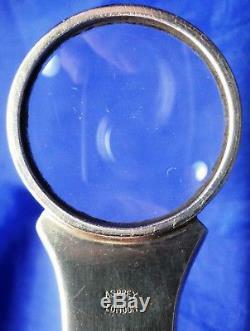 MAGNIFIER & 6 MEASURE IN PRESENTATION BOX. MADE BY THE TOP QUALITY SILVERSMITH &. MEASURES 7 3/4 IN LENGTH (19.5 cm). TOTAL WEIGHT OF 42 g.
IN VERY NICE CONDITION WITH LIGHT SURFACE MARKS. AND WEAR COMMENSURATE WITH ITS 92 YEARS OF AGE & USE. PRESENTATION BOX IS NOT ORIGINAL TO THE PIECE. PLEASE SEE ALL 12 PHOTOS TO CONFIRM THE DESCRIPTION. The item "RARE ASPREYS SOLID SILVER COMBINATION LETTER OPENER, MAGNIFIER & RULER 1926" is in sale since Sunday, September 16, 2018. This item is in the category "Antiques\Silver\Solid Silver\Other Solid Silver". The seller is "nibor612" and is located in West Midlands. This item can be shipped to United States, European Union member countries, Japan, Canada, Australia, Russian federation.